(Nanowerk News) Astronomers have found what could be one of the universe's oldest stars, a body almost entirely made of materials spewed from the Big Bang. The discovery of this approximately 13.5 billion-year-old tiny star means more stars with very low mass and very low metal content are likely out there -- perhaps even some of the universe's very first stars. The star is unusual because unlike other stars with very low metal content, it is part of the Milky Way's "thin disk" -- the part of the galaxy in which our own sun resides. And because this star is so old, researchers say it's possible that our galactic neighborhood is at least 3 billion years older than previously thought. The findings are published in The Astrophysical Journal ("An Ultra Metal-poor Star Near the Hydrogen-burning Limit"). "This star is maybe one in 10 million," said lead author Kevin Schlaufman, a Johns Hopkins University assistant professor of physics and astronomy. "It tells us something very important about the first generations of stars." The newly discovered star's extremely low metallicity indicates that, in a cosmic family tree, it could be as little as one generation removed from the Big Bang. 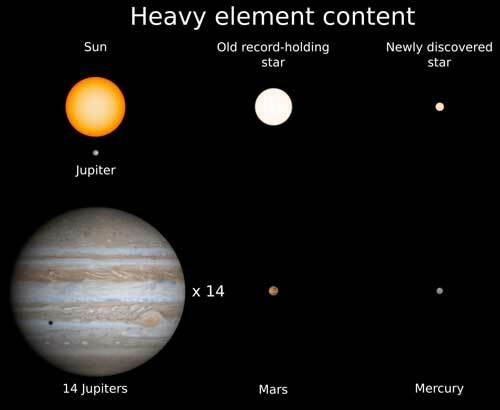 Indeed, it is the new record holder for the star with the smallest complement of heavy elements - it has about the same heavy element content as the planet Mercury. In contrast, our sun is thousands of generations down that line and has a heavy element content equal to 14 Jupiters. As recently as the late 1990s, researchers believed that only massive stars could have formed in the earliest stages of the universe -- and that they could never be observed because they burn through their fuel and die so quickly.